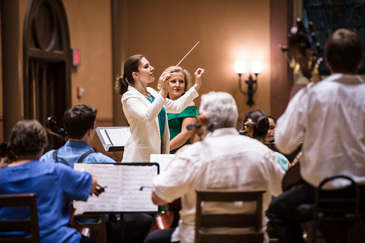 The project was conceived by conductor Lidiya Yankovskaya, who realized in the wake of the Syrian refugee crisis that many of her own closest colleague and friends were not aware that she and many others like her had come to the U.S. as refugees to seek asylum from violence and persecution abroad. Due to the traumatic nature of their experience, refugees are often hesitant to speak openly about their history, and it is common for people to be unaware that their neighbors, coworkers, and friends have been taken in by the United States as refugees at a time of crisis. The concert brings together instrumentalists and singers whose friends and families have fled to this country to escape violence and persecution in performances that loudly proclaim these individuals' importance to our cultural wealth.